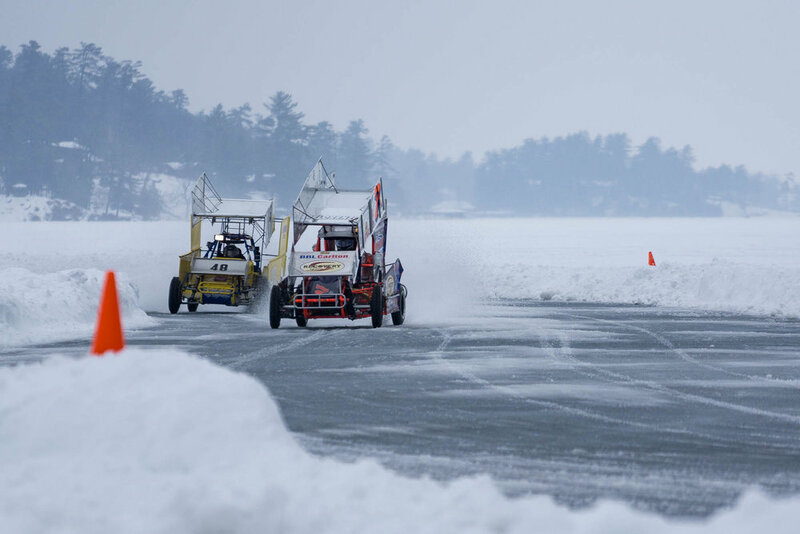 Ice racing is one of those polarizing activities that elicits either excitement or sheer fear. And at first blush, camp shear fear totally wins. 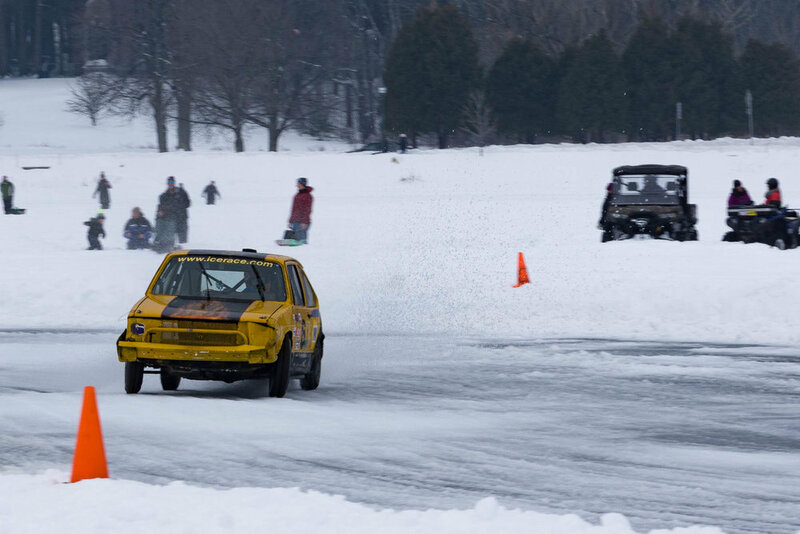 The potential loss of an entire vehicle (and your life) outweighs the novelty of racing on a frozen body of water. However, if you're smart about it (make sure the ice is at least 12” thick everywhere cars are) slaloming through corners on ice becomes rather appealing. Since lakes are generally flat, featureless surfaces, they tend to freeze that way, permitting virtually unlimited runoffs and infinitely variable course layouts. Couple that with incessantly migrating grip zones, and a surface that’s hyper sensitive to temperature swings, and this whole lake racing thing becomes an appealing challenge. But honestly, I think that viewing it as a challenge isn’t the way to go. I firmly believe that grassroots racing is an output of the local culture and geography. 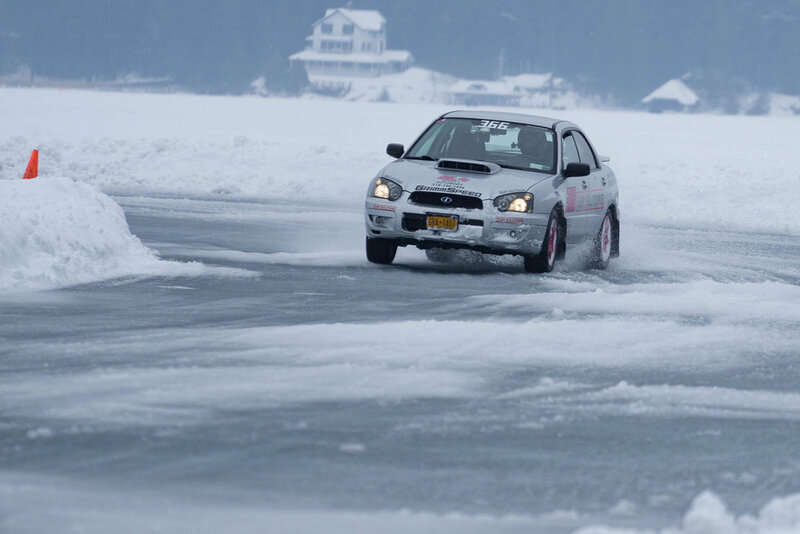 And because of where Lake George is, ice racing was just a natural way for the locals to have some fun. The lake and similarly named town placed in a bit of an upstate NY grey area. Their region isn’t dense enough to qualify as urban (unlike Albany 60 miles to the south), but it’s definitely not wild enough to resemble the wildness enclave of Keene Valley (60 miles to the north). This halfway-between-the-forest-and-the-city environment means people here are just as apt to develop a daily Dunkin Donuts habit as they are to sprint up a local mountain or paddle across a lake to see a neighbor. This constant exposure to nature coupled with the suburban inclination towards cars makes their marriage (racing cars on a frozen lake) almost obvious. 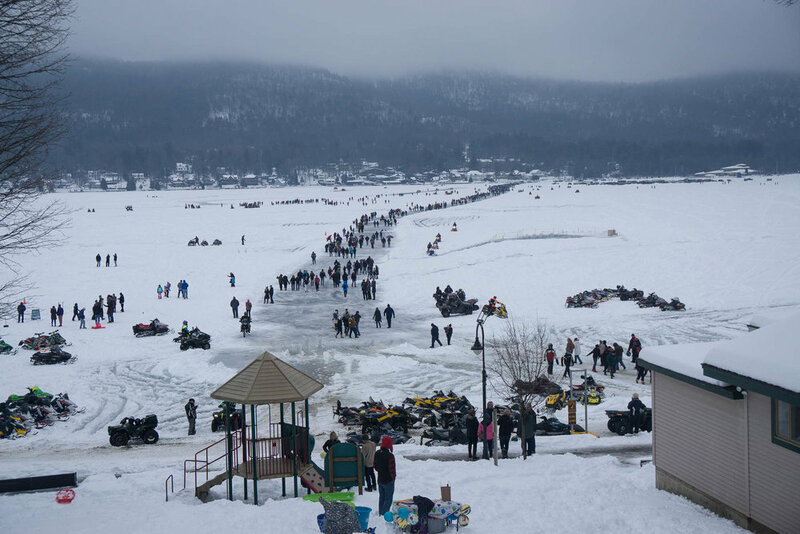 The evidence for this is in the town itself – the ice races were part of the Lake George Winter Carnival, a way for the locals to have fun while the town is in the depths of its low season. Beyond the racing there were polar bear swims, outhouses-on-ice races, an on-ice human foosball tournament and a chainsaw artist. This comfort with the ice extends beyond the carnival. Across the lake, flags and snowmobile headlights demarcated temporary byways that formed perfectly straight lines radiating from town. Ice fishing huts dotted the spaces between these temporary roads, and every so often a rooster tail shot out, highlighting snowmobiles cutting into untouched powder. This widespread utility makes it obvious that ice is no different from any other landbound feature. As a result (at least according to the locals), the idea to race on ice isn’t extraordinary nor is it foolish/brave – its just a natural way to enjoy the local terrain. But enough about the culture. The racing itself was everything grassroots racing promises. This league is easily one of the largest in the country, with the street legal class itself fielding over 40 cars. As in all low-level racing, the fastest lap time wasn’t on everyone’s mind. True, most sought first place, but a good number of others hung back, buying space to pull grin inducing powerslides across every corner. In one race, a Saaburu (an early 2000s Saab 9-3 Aero with Subaru underpinnings) handily lapped cars and drove with the drama of a Sunday cruise, while a trio of Subaru WRX’s hung in the backfield, flooring it through the corners at full opposite lock, driving their cars like they stole them. 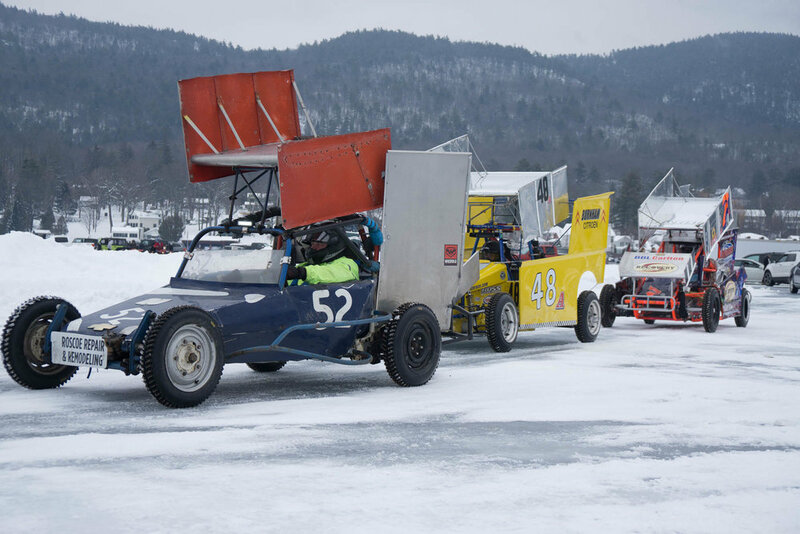 Unlike other ice races, which are time trials, the lake George races are wheel to wheel competitions conducted in 20-minute heats. Sure, speeding inches from other cars on a slick surface is stressful in the least, but a steep penalty for contact, joined with general grassroots respect and a stern dissuasion of beat up jalopies, kept the “bumping is grinding” types off the ice. In fact, drivers were so patient, I witnessed a full course traffic jam as competitors stuck behind a large Subaru wagon respectfully held back through the chicanes – preferring to lose time over risking contact. The maybe-1-mile course itself, provided equal parts challenge and fun with a series of tail-flicking chicanes, wide turns (for sideways action, of course) and a sharp right hander following a a 1/8th mile straight. The previous night’s snow replaced the near unlimited runoffs with soft, 3ft snowbanks. While they appeared intimidating, the mounds were soft enough that both car and driver came out unscathed – even at relatively high speeds. One Saab 93 was caught so softly, that despite a 30-mph introduction to the snow wall, the car was visibly undamaged with all airbags undetonated. While the previous week was frigid, easily producing ice that met the minimum 1-foot thickness requirements, that weekend was warm. The temps on Saturday frequently swung above or below the freezing point and most of the precipitation was rain. Those shifting temps, rain and the abrasion from studded tires produced wildly variable traction zones. 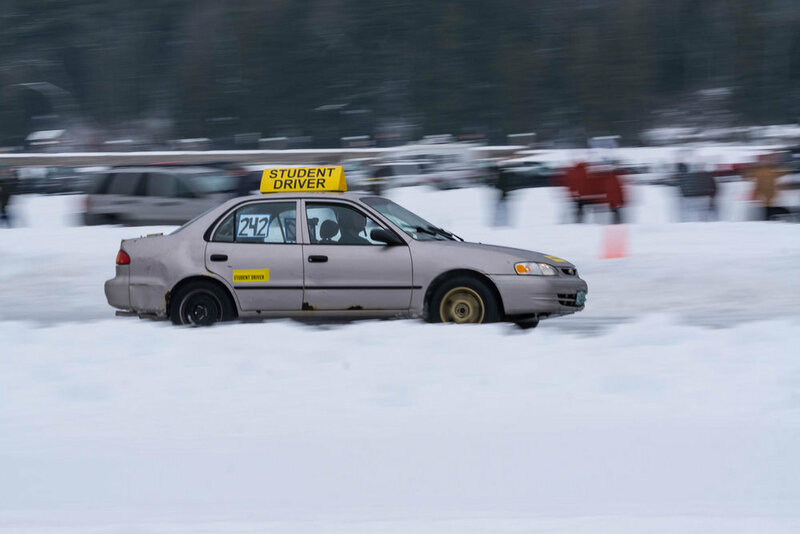 In fact, Michael, one of the event coordinators and an experienced ice racer, fell prey to those variable conditions himself - staring down a right hand turn at 50 mph on slick ice, just inches off from his older, grippier racing line. He estimated the car shed 10 mph before plowing off the course, but like the Saab, the only damage was to his ego as he spent 18 minutes stranded in a snowbank, not racing. The competition continued till Sundown on Saturday, but by closing time, the warm weather and rain had deteriorated the ice to the point that the coordinators cancelled Sunday’s racing. And that’s the trouble with ice racing – speeding on a temporary surface leaves much to chance. Unfortunately with ice, it takes one day of warm weather to undo a month’s worth of freezing temps - But despite the risk of an event cancelling last minute, ice racing’s entertainment value and low wear to machines makes entry totally worth it. Worst case, you can hang with the event coordinators at the registration hut, chatting about former races, their cars, and how the season is never ever nearly long enough.